Universal Studios Hollywood Announces Tickets are Now on Sale to “Halloween Horror Nights,” Southern California’s Most Extreme Halloween Event, Beginning Friday, September 16th! All-New After 2 p.m. Day/Night Combo Ticket Invites Guests to Play by Day then Stay and Scream by Night!! Click Here for a Sneak Peek into the Terror that Awaits at “Halloween Horror Nights” inside Universal Studios Hollywood . Tickets to this year’s event are available for purchase at ww.HalloweenHorrorNights.com/Hollywood, including the Frequent Fear Pass which allows guests to visit multiple times throughout the event. Guests purchasing the all-new After 2 p.m. Day/Night Combo ticket can enjoy the park’s popular daytime attractions such as “The Wizarding World of Harry Potter™,” “Despicable Me Minion Mayhem” and “Fast and Furious—Supercharged” on the world-famous Studio Tour by day, then step into the mazes and attractions located throughout the park to experience the terror of “Halloween Horror Nights” for one admission price. “Halloween Horror Nights” guests can also purchase the popular Front of Line ticket, enabling them to enjoy one-time priority access to all the mazes, attractions, all-new Terror Tram, and the special hip hop dance performances by the returning Jabbawockeez. Advance purchase for all tickets is recommended as event nights will sell out. “Halloween Horror Nights” dates are: September 16, 17, 23, 24, 29, 30, October 1, 2, 6, 7, 8, 9, 13, 14, 15, 16, 20, 21, 22, 23, 27, 28, 29, 30, 31 and November 4 and 5, 2016. For exciting updates and exclusive “Halloween Horror Nights” content, visit www.HalloweenHorrorNights.com/Hollywood, like Halloween Horror Nights – Hollywood on Facebook; follow @HorrorNights #UniversalHHN on Instagram, Twitter, Snapchat and Periscope; and watch the terror come to life on Halloween Horror Nights YouTube. 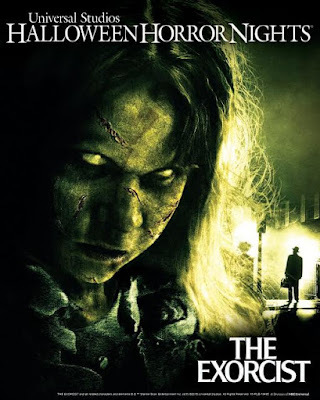 All-New Mazes:* For the first time ever, supernatural thriller, The Exorcist, will take possession of “Halloween Horror Nights” in an all-new horrifying maze. In “The Exorcist,” guests will see, hear, feel – and even smell – every iconic levitating, head-spinning, vomit-wrenching, skin-crawling moment from the film. The maze will recreate some of the film’s most haunting scenes, ushering guests into its unparalleled terror as if their very souls were possessed by the devil. They will be paralyzed with fear as they witness the power of the supernatural, scream uncontrollably as they become part of Regan MacNeil’s possession and run in terror as they try to escape the horrific battle between innocence and evil. * “American Horror Story” has terrorized television viewers for five suspenseful installments, and for the first time ever, three chapters will come to life in a new frightening maze. Guests will venture through Ryan Murphy’s groundbreaking horror anthology, encountering a plethora of iconic scenes and memorable characters designed to jolt them to their very core. Twisted Murder House scenes from Installment 1 will unleash the evil spirits that possess the Harmon estate, spiraling guests through decades of the tortured dead who previously resided there. From Installment 4’s Freak Show, guests will join a troupe of biological misfits in a sinister sideshow where they will be stalked by the murderous and deformed Twisty the Clown. Finally, guests will succumb to the warped desires of The Countess after checking in to the haunted Hotel Cortez, conceived from the beginning as a torture chamber for its customers, from Installment 5. * Escaped mental patient Michael Myers makes a homecoming return in “Halloween: Hell Comes to Haddonfield,” an all-new maze inspired by the second film in the classic “Halloween” horror franchise. Echoing the infamous words uttered by the film’s Dr. Sam Loomis, “You can’t kill the Boogeyman,” the twisted maze will shed new light on the terrifying lunacy of Michael Myers as he scours the streets of Haddonfield and stalks the halls of Haddonfield Memorial Hospital in ruthless pursuit of victims. * In “Freddy vs. Jason,” demented killer Freddy Krueger (A Nightmare on Elm Street) returns to the scene of the crime, this time accompanied by notorious hockey mask killer Jason Voorhees (Friday the 13th) to inflict twice as much terror. Inspired by the 2003 film that brought together two of the biggest icons in horror history, this new experiential maze will thrust guests into an epic battle between Freddy and Jason and a showdown in which the fate of only one mass killer will survive. * The unspeakable terror embroiled within “The Texas Chainsaw Massacre: Blood Brothers” maze will pit guests against the unsavory wrath of demented killer Leatherface and his mentally unhinged brother ChopTop as they unite in misery to expand the family’s cannibalistic enterprise and slaughter a new generation of innocent victims. With the perverse duo at the helm of a grotesque BBQ restaurant staged inside a dilapidated roadside gas station, unwitting guests will soon come to realize the new terror that awaits as the blood brothers continue their hedonistic prey on human flesh. * Tis the season for “Krampus” as the terrifying dark Christmas legend is manifested into a maze based on the Christmas-themed horror film. The dead of winter sets the stage for the terror that’s about to unfold one cold, dank and dreary Christmas Eve as the fabled anthropomorphic "half-goat, half-demon" horned creature emerges to terrorize those devoid of holiday spirit. Guests will navigate the dysfunctional Engel family home to encounter the evil ancient spirit of Krampus – the dark shadow of Saint Nicholas – and his band of Dark Elves and sinister Gingerbread Men, who cause the family to fight to see the light of day. * “The Walking Dead” new permanent attraction at Universal Studios Hollywood will have a starring role at “Halloween Horror Nights.” By elevating the scares with more walkers and effects for the nighttime event, “The Walking Dead” creates a no-holds-barred experience that significantly intensifies any other iteration previously developed within the theme park. Coupled with authentic walker make-up effects, sophisticated animatronic walkers, substantially more detailed set design and costuming, and highly recognizable props replicated from the series, the attraction delivers an uncompromised realistic environment that brings guests even further into the most watched show in cable television history. Scare Zone:* A terrifying twist on this year’s scare zone, “Halloween Horror Nights” introduces a new themed experience, inspired by Universal Pictures’ disturbing blockbuster trilogy, “The Purge: Election Year,” that permeates all areas of the park. Iconic scenes from each of the frightening films will recreate the turmoil and pandemonium that exists when masked vigilantes hunt for victims during the government’s annually sanctioned killing spree. Like civilians in the movie fighting to survive, guests must rely on their cunning wit, luck and speed as they attempt to outsmart and outlive the anarchy brought about by those who believe in an “eye for an eye.” An original scare zone element will be “The Purge: Gauntlet of Fear” that delivers unbridled fear as guests are funneled through an area of the park to try and escape the horrors of the mass slaughter that awaits them. Show:* Back by popular demand, Jabbawockeez, the acclaimed, award-winning hip hop dance crew, returns to the stage within the Special Effects Show venue, donning their signature white masks as they perform a repertoire of innovative, synchronized choreography before an enthusiastic crowd. The all-new, high-energy Jabbawockeez show, created exclusively for “Halloween Horror Nights,” will once again underscore the dance crew’s unique brand of humor as they transport guests into a new realm of gravity-defying dance, elevated to new heights by special effects and pulse-pounding music. My husband and his team from work go every year. They do the front of line passes and make it a team event. I can not wait to hear about all the scares he comes back to tell me about this year and I hope to make it to Halloween Horror Nights one day soon too!